Combine dry ingredients and mix in a gallon sized Ziploc bag or in a large bowl. Lightly spray chicken with Duck Fat Spray. Add chicken to the mixture and shake until wings are fully coated. Spray Duck Fat Spray on the air fryer basket and air fry at 400 degrees for 15 minutes. Eager for more? Try These Tantalizing Tips for Using Duck Fat Spray – And Enjoy! › Coat your pan with Duck Fat Spray before you fry or cook that next egg or omelet, then watch your eggs dance across the pan to deliver a wonderful culinary experience. › Give those brats or sausages a spray before you put them in the oven or on the grill. Trust me: you will notice the difference! › Treat your casserole dish to a light coating before you create your next breakfast casserole or quiche and everyone will be fighting for the crust. › A coating of Duck Fat Spray makes great-tasting steak even better. Whether your steak is grilled or seared in a cast-iron skillet, Duck Fat Spray enhances the texture and brings out the flavor. 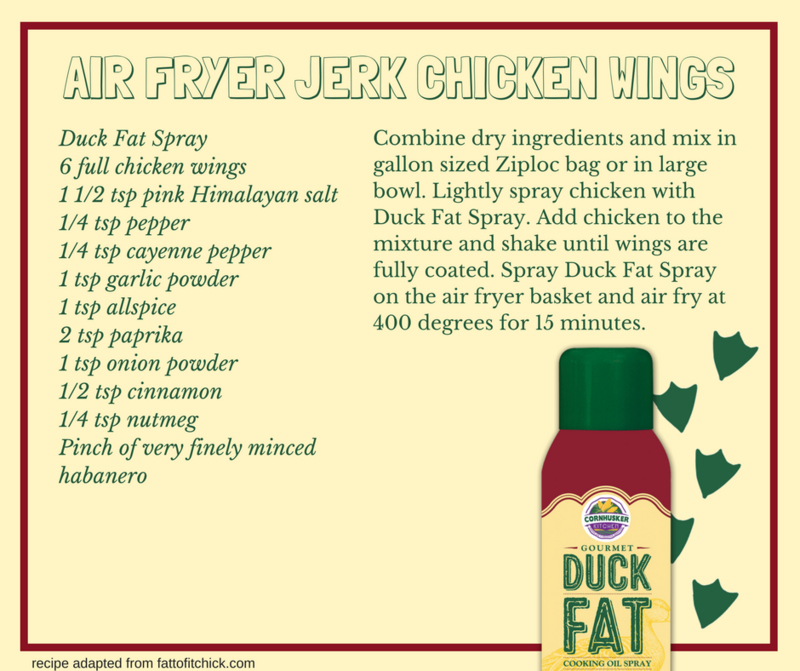 › Your smoked meats have been begging for Duck Fat Spray. Your rub will stick beautifully to the meat and the "bark" will be the best you’ve ever had. › Waffles and pancakes will taste better than ever when you pre-treat your griddle with Duck Fat Spray. › Place baby carrots on a cookie sheet with a light spray coupled with your herbs of choice. Your guests will be talking about that appetizer for weeks to come. A little Duck Fat Spray goes a long way! It never overpowers, it only enhances! Duck Fat Spray makes good food better. Copyright 2016 Cornhusker Kitchen. All rights reserved.